Milena Nova is someone I often meet while photographing protests, and when I saw her outside Westminster Council Offices on Thursday I remembered to ask her if I might use her picture of me on my blog. I have a simple policy about using other people’s pictures, partly a matter of the cautious legalism of my former employers at About.com but more a matter of my respect for copyright law – which protects my own work – and I only use other people’s images with their permission. Earlier I’d posted a link to it – and again in my opinion you never need permission to publish a proper link – but it was a link to her Facebook page and might not have worked for some. So here it is. 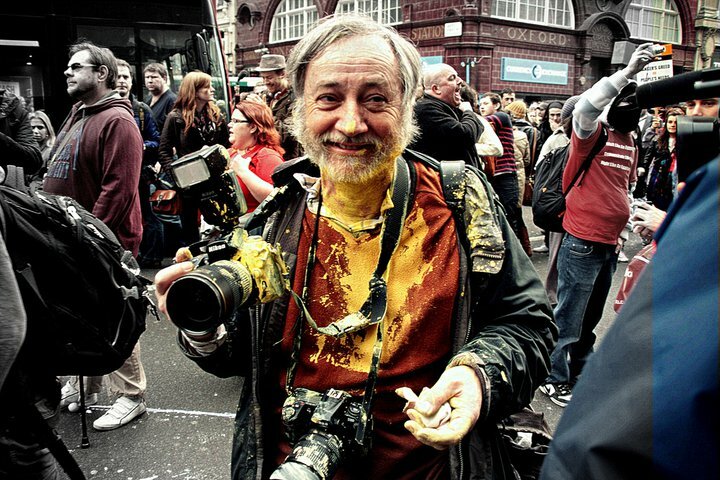 Taken just a minute or two after I was hit by a paintball at Oxford Circus. I’m clutching a handkerchief in my hand that I’ve used to wipe a little paint off, but to little effect. My wife likes this picture, though I’m not quite sure how to take this. Would she like to throw paint at me? I think it is the best that I’ve seen of me in this state, but I’d rather it hadn’t happened. I’m smiling at Milena because she is a friend taking my picture, but I was really pretty fed up. But I wasn’t prepared to give up. Today I didn’t get anything thrown at me, which was perhaps a bit boring, given that successive Saturdays it has been paint, feathers and flower petals I was wondering what the next member of that series would be. Along with others I did get assaulted by one young man who thought that being one of the stewards on a march gave him the right to push photographers around, but otherwise most people were very friendly. But perhaps more about that later. This entry was posted on Saturday, April 16th, 2011 at 06:03 pm and is filed under Photo Issues, Political Issues. You can follow any responses to this entry through the RSS 2.0 feed. You can leave a response, or trackback from your own site.